Today is a floral upon floral kind of day friends! 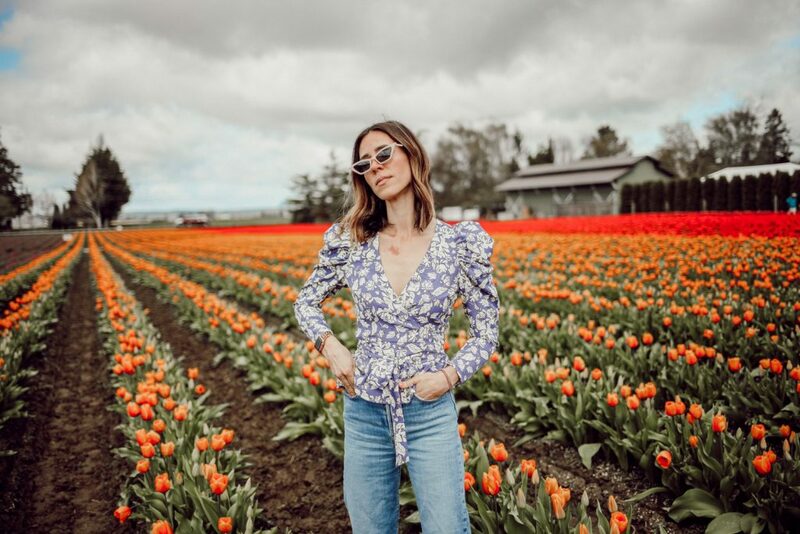 Last week, Cortney, from The Grey Edit, and I, ventured an hour outside of Seattle to visit the Skagit Tulip Fields. I mean, why would anyone ever travel to Amsterdam when you have fields of tulips in your backyard! 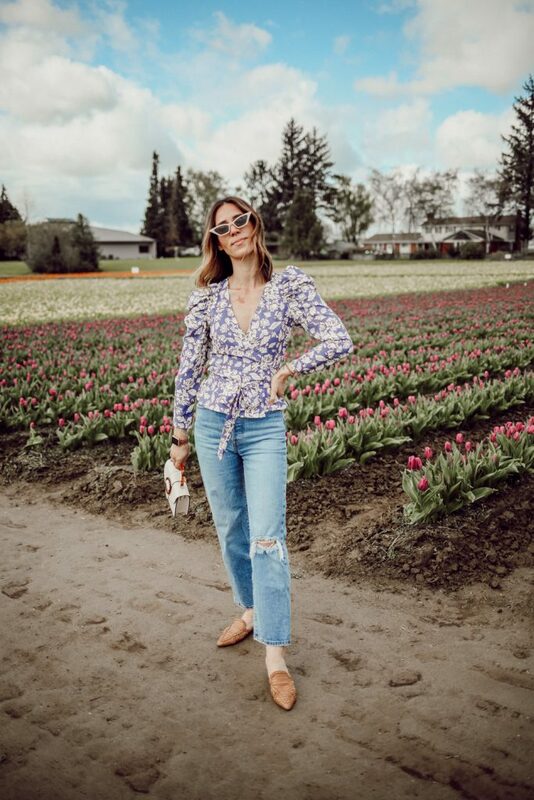 In anticipation of the trip, I headed to Nordstrom to pick up some gorgeous floral pieces to truly captures all things spring and floral. 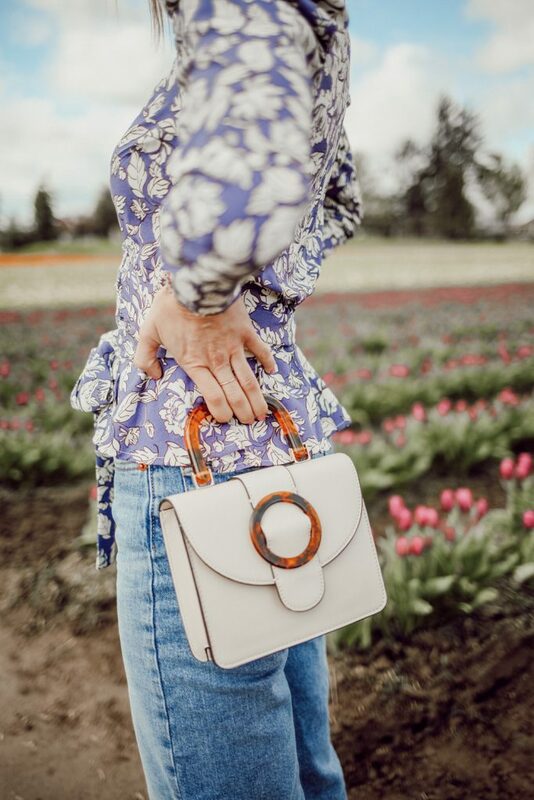 This ASTR the Label puff sleeve top needs to be bumped to the top of your spring must-haves list! I know I talk a lot about versatility, but it really is important to me when building my closet. When I’m at the store and I can’t think of at least three ways to style or wear the item, I’ll move on. It takes serious self control, but it’s doable! 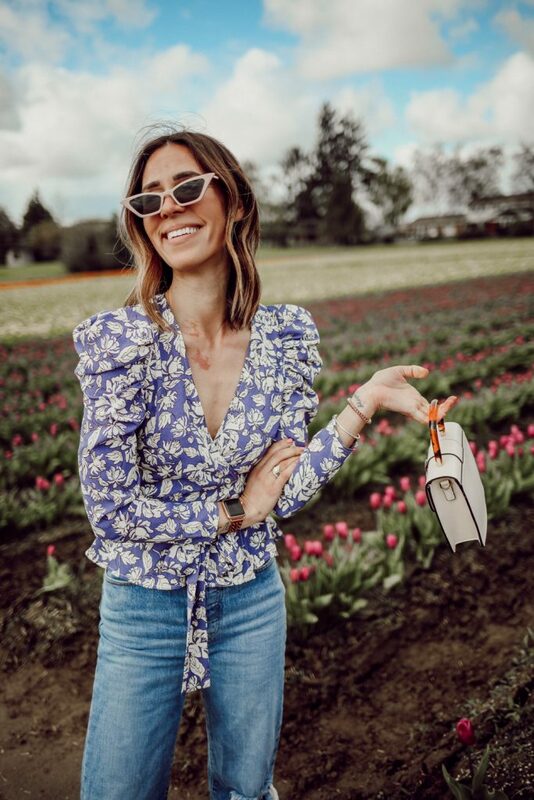 this ASTR the Label Floral Puff Sleeve Top is the perfect versatile floral top. 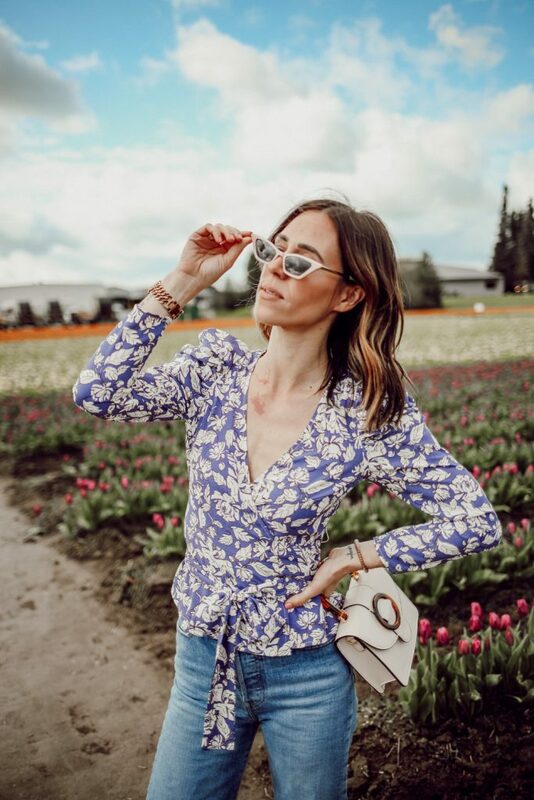 From the puff sleeve to the wrap waist to the print, the details on this floral top are just perfection! These Levi’s Ribcage Denim have been the jeans I grab for nearly every day – I don’t think I have a high waisted jean that rivals these. Not even all my H&M favorites. The cut is flattering on everyone and unlike most Levi’s, they are made of a strong denim that helps keep everything in! A few weeks ago I styled this with a red blazer and some 90’s inspired heels for a throwback look. 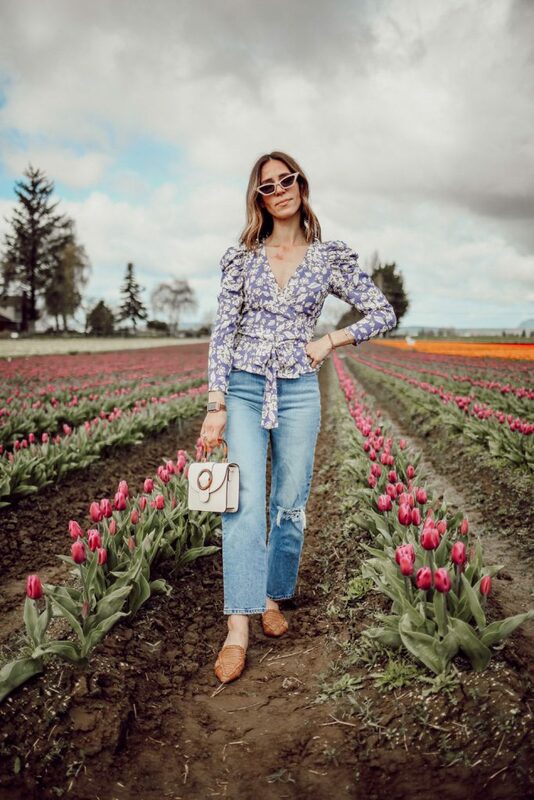 I had to style the casual look with my favorite spring Woven Mules – I cannot say enough good things about these mules. Not only are they super comfortable, but you can wear them anywhere and all day! They also come in white which has been a tempting purchase for me! To finish off the look, I grabbed my favorite neutral Cat Eye Sunglasses and this new Topshop Bag top handle bag! I love Topshop bags – they are so easy and always under $50!! This one styles as a crossbody too! 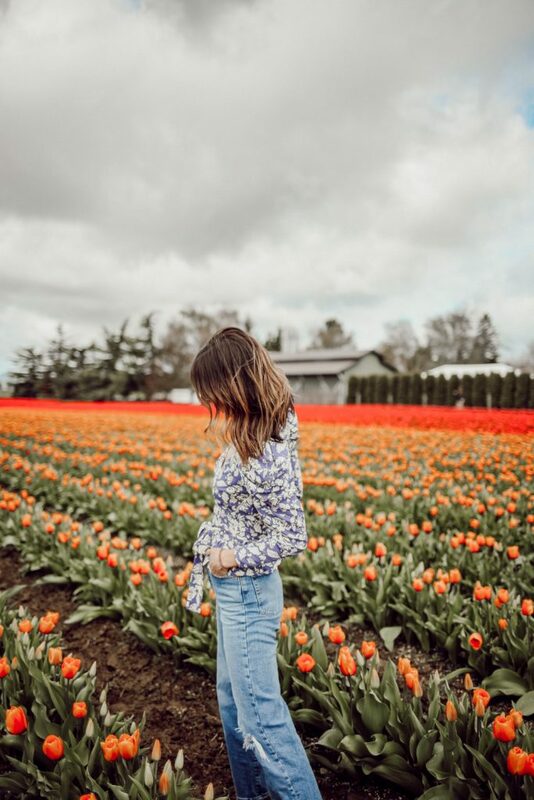 If you are in Seattle, or are coming to visit, and want to visit the Skagit Tulip Fields, here are a few things to consider for your trip! Coming from Chicago where flowers don’t bloom until June, this was certainly something to see! If you can make time for it in your schedule, I’d highly recommend it – it’s certainly something to see! To avoid lines, traffic and lots of people, try to go during the week. We went on a Tuesday and it was very comfortable and parking was easy. The festival will go on from now until April 30 – so plan accordingly! Entry costs $7 to get in and you get access to to re-entry if you leave (to change your clothes like we did). This website is super helpful and can easily direct you to the fields – there are few different ones that should all be in blooom right now.